Though it seems like an odd denomination today, the quarter eagle, or two-and-one-half-dollar gold piece, was included among the earliest line-up of United States coins authorized in 1792. Examples were coined in small numbers almost every year from 1796 through 1808, when production was suspended until 1821. Minted more or less regularly after 1824, the quarter eagle was fitted with Christian Gobrecht's bust of Liberty in 1840. This was paired with the familiar heraldic eagle that had been used in one form or another since the beginning of quarter eagle coinage. The Coronet Liberty quarter eagle was produced annually from 1840 through 1907, though not all the U. S. Mints participated in each year. From 1880 onward only the Philadelphia Mint continued to strike quarter eagles. While earlier issues had been used in general circulation and are thus often found quite worn, the coins of 1878-1907 were produced almost exclusively to meet the demand from collectors and from those presenting them as holiday and birthday gifts. Thus, the later dates are typically seen uncirculated or fairly close to it. 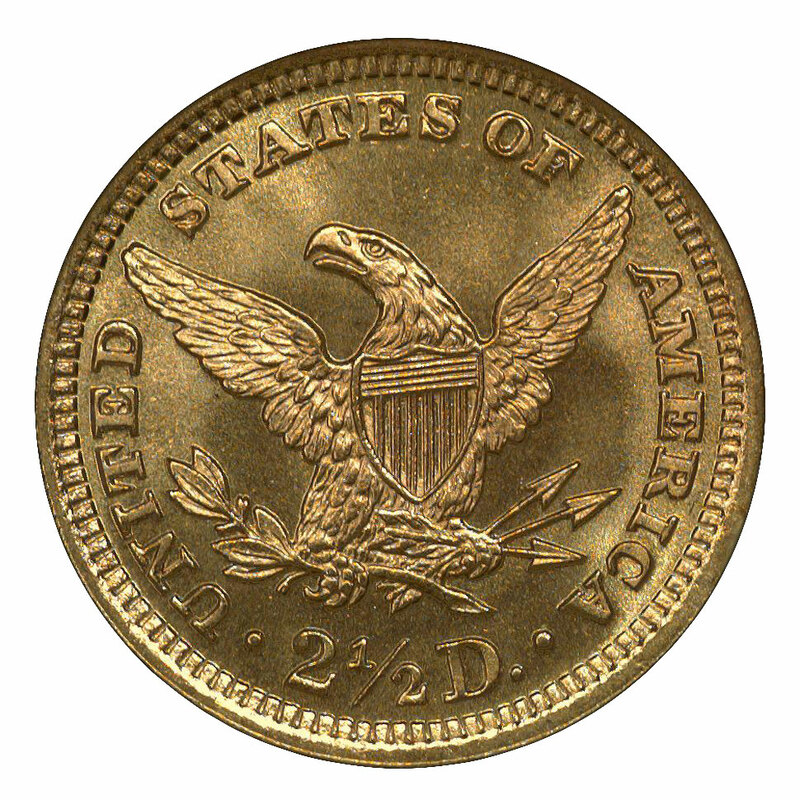 So popular were quarter eagles of this type for presentation purposes that they carried a premium after the Indian Head type appeared in 1908. Bank tellers typically would furnish them only when provided with a little extra incentive. With but a few exceptions all Coronet quarter eagles prior to 1878 are scarce to rare in mint state. 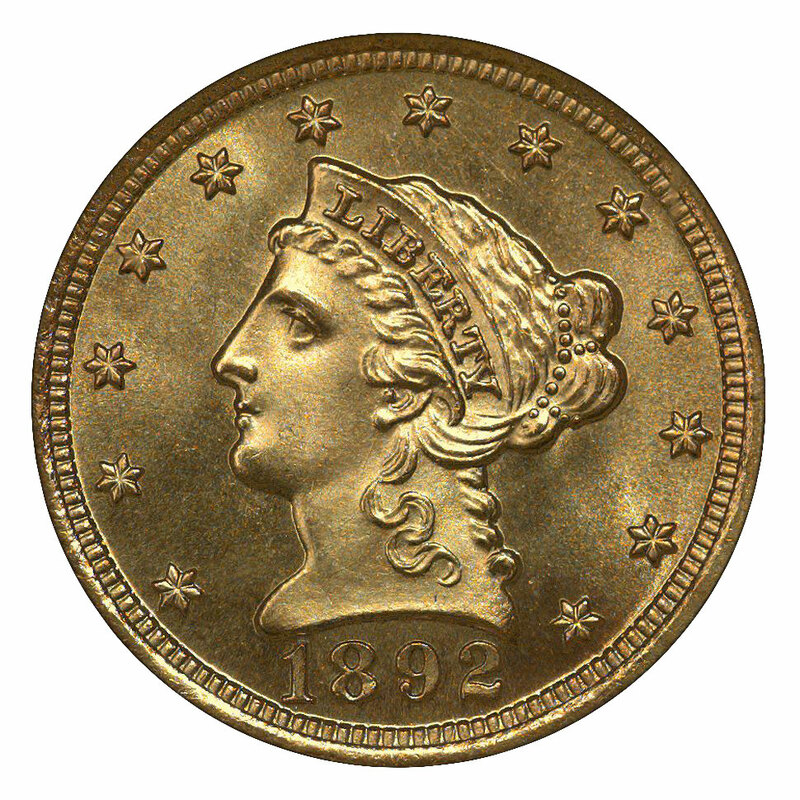 (1878 was the year that federal paper money, introduced in 1861 as a wartime measure, finally achieved value parity with gold coin. This meant that gold pieces could once again be obtained at face value. Surprisingly, however, the public favored paper over gold, so long as it knew that gold was available when desired.) Among the few dates prior to 1878 encountered in mint state with some frequency, all are from the Philadelphia Mint. These include the large Gold Rush-era mintages of 1851-54 and 1856. The 1861(P) quarter eagle is likewise often found uncirculated, as this date was hoarded when both banks and the federal government suspended payment of gold coin that year. Another early date that one may encounter uncirculated is 1873(P), as the Mint made an abortive and premature attempt to force gold coins back into circulation. Even these relatively common issues are typically graded below MS-63, and gems of any date before 1878 are quite rare. Also a problem with the earlier dates is that they are often found weakly struck, particularly at their centers. This is most true of coins from the southern mints (Charlotte, Dahlonega and New Orleans), but it is also a problem for many of the San Francisco Mint coins of the 1860s and ‘70s. Fortunately for collectors this coin type experienced only very slight changes during its 68-year run, and those seeking just a single example for a type set can limit their search to the later dates. 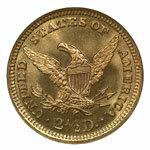 The coins from 1900 to 1907 offer the best opportunity for obtaining a choice or gem specimen. These issues were extremely well made and also were widely hoarded. Perhaps the extra care taken in the manufacture of quarter eagles from about 1880 to 1907 was acknowledgment by the Mint that these coins were more collectibles and keepsakes than actual circulating currency. Gold coins, even when alloyed with copper as they were by the U. S. Mint, were highly vulnerable to contact marks. The number and severity of contact marks are thus the primary factors in determining a gold coin's grade. Luster is another element in grading these pieces. Most larger-size gold pieces of the 1800s have so many marks that they've lost some of their luster, except in the areas protected by raised design features, but this situation rarely exists with the diminutive and lighter-weight quarter eagle. Also an issue with all alloyed gold coins is the occurrence of red or orange spots, which result from concentrations of copper near the coin's surface. 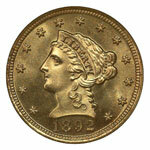 While normal on U. S. gold coins, they can be aesthetically distracting to some. They do not, however, factor into lowering a coin's grade; experienced graders recognize their presence as being indicative of originality in a coin's surfaces. The ideal specimen of the Coronet Head Liberty quarter eagle is sharply struck throughout and has minimal impairments to its luster. There are many such Coronet quarter eagles within the 1900-07 date range, and these coins provide the greatest opportunity for the type collector.